On the heels of yet more lackluster economic data, Apple’s widely scrutinized miss, and ahead of yet another of Team Yellen’s cheerleading sessions Thursday, many investors are understandably nervous about what happens next in the stock market. That’s totally understandable but I want to let you in on a little secret… achieving higher returns is easier than you think. There’s no question that having the right stock picks is important, but it’s not the “do all end all” many investors think, and that’s what we’re going to talk about today. As always, I’ve got a recommendation for you that makes an ideal cornerstone investment for any investor interested in both the truth and higher returns. Like many investors, I grew up thinking that individual stocks were the way to go. Certainly everything I read as a young man coming into finance reinforced that notion: Forbes, Money Magazine, and Kiplinger’s, just to name a few. My boss, a hyper-focused and brilliant guy named Larry Davanzo, told me in no uncertain terms that portfolio structure was something I’d better come to understand if I wanted to be successful – and with billions on the line, he wasn’t kidding. So I spent hours in my cubicle burning all kinds of midnight oil and plenty of weekends, too. Like many investment professionals at the time, I focused much of my attention on a 1986 study by Gary Brinson, L. Randolph Hood, and Gilbert Beebower called the “Determinants of Portfolio Performance” that examined quarterly returns from 91 pension plans over a 10 year period from 1974 to 1983 and concluded that asset allocation accounted for 93.6% of the volatility of quarterly returns. It was the start of a badly flawed (and disproven) line of thinking that’s still embodied today in the concept of passively managed portfolios advocated by well known people like Jack Bogle and Burton Malkiel – but that’s a story for another time. Something didn’t sit well with me and it took me years to put my finger on it, not to mention do the math to prove it. In other words, the authors assumed that money was simply “along for the ride” rather than in the driver’s seat. It also meant that the role of diversified stock pickers was almost completely ignored. Over the years, I continued to play with this thought. Others like Roger Ibbotson and Warren Buffett who are considerably smarter than I am did, too. It’s based on specific levels of risk that are divided equally across the entire portfolio as a means of achieving the optimal asset concentration needed for higher returns. Traditional allocation strategies, by comparison, are based on having fixed percentages in specific asset categories… stocks, bonds, real estate, metals, etc. The advantage of a risk parity approach is that you can easily measure the contribution of every investment to your overall portfolio’s risk and, by implication, manage that change over time. You cannot actively do that with conventional models and you sure as heck cannot do that passively as is taught in universities worldwide as part of the Efficient Markets Hypothesis. If you’re not into math, have no fear. I’ve got you covered. What you need to know is that it doesn’t matter whether you have a few thousand dollars to your name or hundreds of millions. 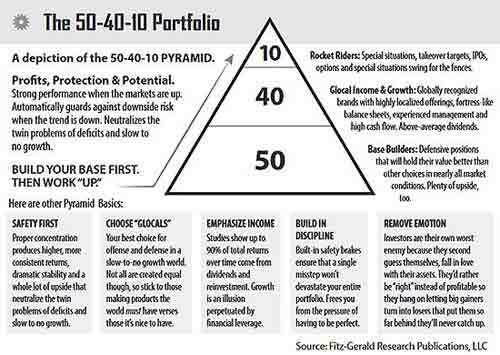 You can make the 50-40-10 work for you and your money. Here’s what it looks like – a pyramid. The bottom layer – the 50 – is chock full of stuff your mom told you to eat because it’s good for you even though you thought it tasted like wall paper paste. These are “foundational” investments chosen for their ability to withstand market volatility while giving you a rock solid base from which to pursue growth. The middle layer – the 40 – is the stuff that tastes good and makes you want seconds because it helps you grow. These are typically global companies with fortress like balance sheets, growing top and bottom line numbers making “must-have” products and services tapped into the Unstoppable Trends we talk about so frequently. Most typically have above average yields, too, making them a super choice for income oriented investors. The top layer – the 10 – is the beer and chips or the chocolate mousse depending on your palate. It’s the much higher risk stuff that can make you fat if you eat too much but when used in the right way can really put a smile on your face, not to mention some serious bling in your wallet. They’re usually oriented around a specific catalyst that our research has uncovered. Examples include new patents, contracts, buyouts, spinoffs, etc. Even better, the pyramid forces you to “eat” healthier choices when it comes to your money – just like a balanced meal. So you have discipline injected into your investment process automatically. You can’t tuck into the soda, the mousse, or the chips if you’re minding your money, for example. I bring this up because many investors wind up with far too many speculative investments on their financial plate. They get caught up in their emotions when they buy things. Not surprisingly, they almost always find out the hard way that they’ve been speculating when they should have been investing whenever the market hiccups. That’s primarily because their risk is disproportionately concentrated even though their allocation may be spot on, according to conventional Wall Street thinking. Ask anybody who lived through the dot.bomb crash and the Financial Crisis how that worked out when everything went down at once and conventional diversification models failed… completely. I hear from people all the time that the sky is falling, things are terrible and there’s nothing to invest in. And, I couldn’t think of a better way to allay their fears than to use data from the worst financial period in modern history. So, I constructed a hypothetical $10,000 portfolio using just 11 investments and split them up according to the 50-40-10 model. Then, I let it run from August 1, 2000 to September 23, 2015 and rebalanced annually on the first trading day of every year using publicly available closing prices from Yahoo!Finance and Kitco Precious Metals to keep things simple. I chose those dates very deliberately because that time frame includes several wars, recessions, market crashes, terrorism and even a global collapse, just for good measure. The S&P 500 returned 34.81% from August 1, 2000 to September 23, 2015 but the 50-40-10 returned a healthy 360.85%. That’s a 326% performance advantage. I have nothing against people who are worried. As we’ve discussed, that’s a very normal albeit an emotional input. My point is that history shows beyond any shadow of a doubt that there is a way around every market obstacle. Until you let go of the concept that spreading your money around willy-nilly using Wall Street’s classic approach to diversification and the Efficient Market Hypothesis is the way to go, you are at the mercy of unseen risks, not to mention emotional hang-ups. Both can override what you logically understand about the world we presently live in. 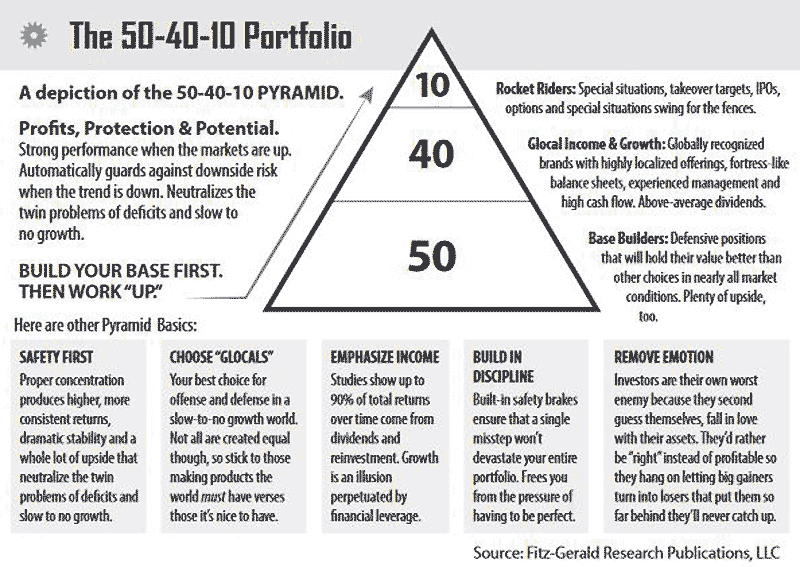 Speaking of which, there are all kinds of ways you can assemble a 50/40/10 model for yourself and we talk about those frequently in the Money Map Report along with specific recommendations in each tier. If you’re not a subscriber, you can get started with a core holding like Vanguard Wellington Fund (VWELX). Chances are, you’ve heard me talk about the Wellington before, and with good reason. Created in 1929, the Wellington is one of the most established mutual funds in history, has experienced management, and is part of a proven family of funds offering great stability, low fees, and easy access. Plus, it’s a great way to manage risk and a path to higher returns even if you’re not sure how to define it in today’s complicated markets. HI! I am a little shy for words considering I have been pummeled by this volatile market. I am very new to this stock market and I have been listening. I am not like some of your investors. I have very very little capital left to invest. Not very certain which direction to go. I personally only have the capability to buy stocks. No options or shorts or any other type of investment. So I am targeting one company at a time at the moment. Believe me. I lose money everyday knowing the numerical sequences which arose before a major spike or step stone down the stairs before it decides to rise back up. Trov. Is a perfect example. Bought in in the 5.60 range and got out just before she fell as I did with Trxc. I was very lucky to read it in time. Lost a bit but not out for the count. Was left slightly under the 1k I have left from the crushing blows I took while looking away in trust. Hence the reason I know charts and numerical sequences in its own state of algorithm needs to be monitored. So there’s no more surprises. Simply put. Cannot afford another loss as I am limited. Especially to this day forth. I am in need. Badly. All said in done. I like what you offer as in time when I break this market down to a science and through algorithmic sequences over periods of time which light up red flags. I like to give back even when I’m down as I am. So I give you, if not known. My great find in the marijuana sector. Buy now as cheap as it is. This quarter was enormous for the company. Organigram. OGI. Do your research as you should but if I’m right and last year’s earnings for them at this time in 2015 was 15,000 and change and 2016 earnings for this quarter are 1.4 million. Pretty sure that should move the stock price. Not sure what kinda of spike this generates but I imagine it will be a great one. I hope this is an opportunity to get my money back as I am pressed for time and new living arrangements. Stat. Hello Robert and thanks for taking the time to post such a thoughtful comment. Obviously I cannot give you individualized investment advice because I know nothing about your personal situation except what you have written. Still, I have a concern for any investor in your situation. While I applaud your initiative and research in identifying individual companies with terrific promise, I am also hearing you say you don’t have a lot to invest. That strikes me a lot like playing roulette in a casino. While it is true you may get extraordinarily lucky and pick on that zooms higher, the odds don’t favor that outcome. So, if I may be so bold, I’d like to encourage you to think seriously about what you want to accomplish and consider a choice like the Wellington that I highlighted in this column. A diversified mix of stocks and bonds, it exposes you to ALL of the market’s upside potential. The ball – to use the roulette analogy – could then fall on a huge variety of numbers (stocks) and the outcome would be more wealth. I know that doesn’t seem like as fast a path to wealth, but it’s a solid one if your priority is not losing what you have. A single company can blow up spectacularly but odds are the entire market will not disappear overnight. Is the Wellington Fund something to put in the 50 category? Will you ever reveal what the 11 investments and allocations are? I’m guessing 5% in physical gold since you looked at Kitco, and a big slug of Wellington. I don’t like EMT either and am always looking for quantifiable alternatives that don’t send risk too high.